St. Thomas Aquinas gained the discipline to remain chaste after experiencing a dream in which angels bound him in a fiery cord. The monks were extremely impressed by the level of dedication they found in the five-year-old child. He stayed with them in Monte Cassino until 1236. It was then that one of the brothers wrote to Thomas’s mother and informed her that his brilliance would fade into obscurity if the boy was not pushed to achieve beyond the level of education the monastery could provide him. Shortly thereafter, Thomas enrolled in the University of Naples, where he studied until sometime in the early thirteenth century. When he joined the Order of St Dominica, his family was shocked that someone of noble birth would choose the life of a pauper. Out of fear that his family would come to take him away, the Dominicans decided to send Thomas to Paris. On his way to Paris, however, Thomas was accosted by his brothers at his mother’s bequest and held captive for approximately two years in the fortress of Giovanni at Rocca Secca. During his imprisonment, his family tried desperately to talk him out of his chosen vocation. His brothers went so far as to send a beautiful woman to his room to seduce him and break his oath of celibacy. He chased the girl from his room with a poker retrieved from the fire. That night angels appeared to him in a nightmarish dream—angels who wrapped him up in a cord of fire so terribly painful that he awakened with a cry. The cord was a girdle of eternal chastity; he never again suffered from the desires of the flesh and lived the remainder of his life in celibacy. The duration of his imprisonment he then spent in study, just as he would have if he had actually been in Paris. Eventually, his mother granted him freedom, and Thomas finally was able to return to the Dominicans. They were relieved to discover that he was as educated in theology and the scriptures as he would have been if he had not been sidetracked, perhaps more so. At some point during the years 1244 and 1245, he became a student of Albertus Magnus, a renowned professor of the order. They traveled together to Cologne, where Magnus was to teach at the university. Magnus initially thought that Thomas was slow, due in part to the boy’s overwhelming modesty and humility. But after reading Thomas’s brilliant defense of a particularly difficult thesis, Magnus had cause to reevaluate his opinions. Then, in 1250, Thomas Aquinas achieved a place among the priesthood. After spending years with Magnus in Cologne, Thomas traveled to Paris to attend the university and earn his doctorate of theology. A bitter dispute at the university delayed this significantly. It was at the university that Thomas wrote The Majesty of Christ, said to be inspired by a suggestion received in a dream in which a heavenly visitor instructed him. In 1256, he finally received his doctorate. Nine years passed before the Pope chose to honor Thomas Aquinas with the position of Archbishop of Naples. If he had received the position earlier, he probably would never have had the chance to write his chief work, Summa theologica. He also collaborated on the Studia generalia of the Dominican Order, a system of studies and a handbook of piousness, before he died on March 7, 1274, at Fossa Nuova. On July 18, 1323, Pope John XXII canonized Thomas Aquinas. Although he lived for less than fifty years, St. Thomas Aquinas signed his name to more than sixty-six religious masterpieces. Each embodied remarkable insight and piety. The Summa theologica was his magnum opus. 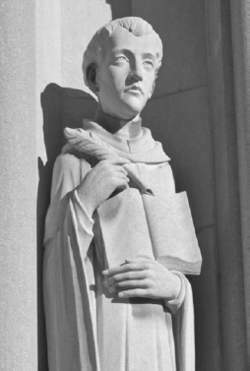 St. Thomas claimed to have been advised on the content of certain passages from a dialogue he had with the apostles Peter and Paul while dreaming. Regardless of the very non-Aristotelian dreams that plagued his life, St. Thomas attempted to rewrite all of the Christian theology in the language of Aristotle and categorized it accordingly. It was his an attempt to diminish the value the common people put in their dreams. St. Thomas concluded that divination through dreams was lawful as long as one was positive that the dream stemmed from divine design and the dreaming state used to achieve said dream lacked artificial influences. He also acknowledged the demonic influence in the common occurrence of prophetic dreams and nightmares. Thomas Aquinas, I might say that I have the best of both worlds--a Harvard education and a St.
We have much to celebrate - our academic programs in education, nursing, business, and the liberal arts are producing some of the leading professionals in the community; and our non-academic programs such as the lecture series, St. In his homily, Father Mascari reminded his Filipino brethren about the inspiration of St.
704 million would be used to finance the livelihood projects for people's organizations whose members were affected by the sinking of the St. Instead of the watered-down gruel served up by most higher education institutions, students in TAC's summer program study Plato, Sophocles, Euclid, St.
Balilo said nurses, doctors, health workers and social welfare representatives were on board the BRP 003, which recently came from Cebu for the search and rescue operations for the victims of the sunken MV St. Judged by the law of freedom; a history of the faith-works controversy, and a resolution in the thought of St.
Shaffer's charities included UJA-Federation and the St. The academics are daunting: In the summer program, students study Plato, Sophocles, the Founding Fathers, Abraham Lincoln, St. He holds a doctorate in Sacred Theology from the University of St.
MANILA -- Two more bodies were recovered by divers on Friday from the sunken ferry St.
A Mass of Christian burial will be celebrated on Monday at 10:00am at St.